Prayer is a deeply personal act through which we commune, petition, reach out, and give thanks. This collection of photographs embraces the human family in moments of this intimate gesture. 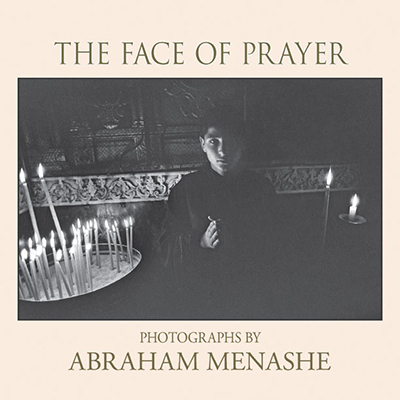 Although prayer is present in all aspects of life, this book centers on the traditional religious form: a figure with clasped hands in the dark space of a church, pilgrims at the site of a shrine, a pious man dancing by a sanctuary. In each setting I focused on the inward attitude rather than the outer rite. The photographs were made in the United States, Mexico, Portugal, Israel, Singapore, and Bali. Each region contributed a view of humility; together they are bound by a common spirit, present when the human heart yields in reverence. When we attend to prayer, its nature becomes known to us. We take refuge in stillness, and in our most naked state become receptive to a life force that nourishes, heals, and makes us whole again. To the extent that we have the courage to seek moments of solitude and listen to our inner voice, we will be guided by a light that lives in us. We come to know a love that does not disappoint—peace the world does not offer. The Face of Prayer, Abraham Menashe, available from iTunes.